Used by: The Royal Naval Air Service from late 1916. The Sopwith Triplane was a British single seat fighter aircraft designed and manufactured by the Sopwith Aviation Company during the First World War. It was also known as the Tripehound or the Tripe. The Sopwith Triplane first saw service with the Royal Naval Air Service in December 1916 and proved to be a formidable warplane. Despite this the Triplane was built in comparatively small numbers and was replaced by Sopwith Camels in the second half of 1917. Surviving aircraft continued to serve as trainers until the end of the war. The fuselage and tail assembly were modelled on the Sopwith Pup but it had three narrow-chord wings to provide the pilot with an improved field of view. Ailerons were fitted to all three wings. By using the variable incidence tailplane, the aircraft could be trimmed to fly hands-off during dogfights. The Triplane was initially powered by the 110 hp Clerget 9Z nine-cylinder rotary engine, but most production models were fitted with the 130 hp Clerget 9B rotary. At least one Triplane was tested with a 110 hp Le Rhône rotary engine, but this did not provide a significant improvement in performance. The Triplane was very agile. The prototype, serial N500, first flew on 28 May 1916, with Sopwith test pilot Harry Hawker at the controls. Within three minutes of takeoff, Hawker startled onlookers by looping the aircraft three times in succession. The Triplane's combat debut was highly successful. The new fighter's exceptional rate of climb and high service ceiling gave it a marked advantage over the German Albatros D.III, though the Triplane was slower in a dive. The Germans were so impressed by the performance of the Triplane that German aircraft manufacturers produced 34 different prototypes, including the Fokker V.4, which developed into the successful Fokker Dr.I. For a variety of reasons, the Triplane's combat career was comparatively brief. It was difficult to repair and relatively minor repairs had to be made at rear echelon repair depots. For example, the fuel and oil tanks were inaccessible without substantial disassembly of the wings and fuselage. To make matters worse, spare parts became scarce and, during the summer of 1917, No. 1 Naval Squadron's complement was reduced from 18 to 15 aircraft. Another drawback of the Triplane was its light armament. Most Triplanes were armed with a single synchronised Vickers machine gun. Attempts to fit twin guns to the Triplane met with mixed results. Clayton & Shuttleworth built six experimental Triplanes with twin guns. Some of these aircraft saw combat service with Nos. 1 and 10 Naval Squadrons in July 1917, but performance was reduced and the single gun remained standard. In June 1917, No. 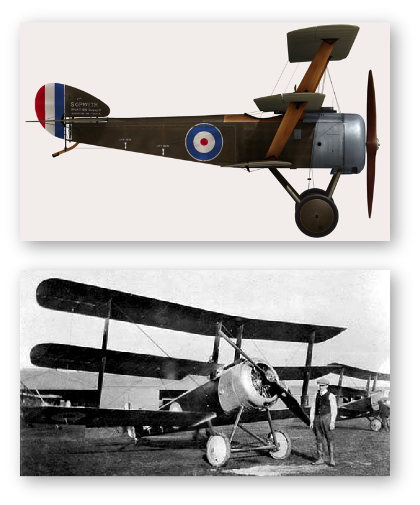 4 Naval Squadron received the first Sopwith Camels and the advantages of the sturdier, better-armed fighter quickly became evident. No. 8 and No. 9 Naval Squadrons switched to the Camel between early July and early August 1917. No. 10 Naval Squadron converted in late August, turning over its remaining Triplanes to No. 1 Naval Squadron. No. 1 operated Triplanes until December, suffering heavy casualties as a consequence. By the end of 1917, surviving Triplanes were used as advanced trainers with No. 12 Naval Squadron.